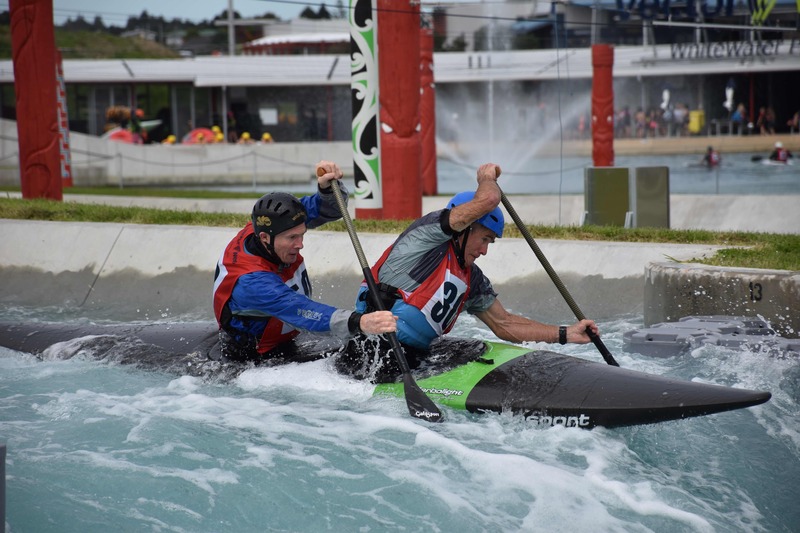 Diary of a middle aged kayaker - World Masters Games, Auckland 2017; Dropping the weight of expectations. The WMG have been my training focus for the last couple of years, and I’ve put in plenty of time and effort to prepare. It was a treat to be on the start line with world class paddlers like Peter Micheler, Vincent Fondeviole and Donald Johnstone. Off-water, the camaraderie of the Masters Games made it a very special event, like a high school reunion with people you’re actually pleased to meet again. The slalom took place over two days at the Vector Wero course in Auckland. The first day was framed as qualifying on the grade 1 -2 Tamariki course. It was classic format, with the best of two runs used to seed a semi-final the next day on the grade 3 – 4 River Rush course (or as it was better known, the Far Canal). Medals were then awarded based on a final, reverse seeded by the semi-final. Then to top it all off, team events back on the Tamariki course. 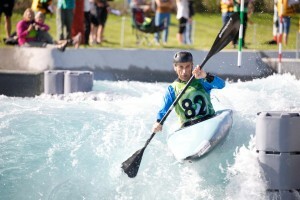 The qualification course was intended to make the Games accessible to paddlers not confident on the tougher course. The gate sequence was straightforward, apart from downstream gates 11 and 12 which required a cross through a small, but very inconsistent stopper. A combination of luck and skill was needed to get a fast line and many people lost time here. I didn’t paddle smoothly on my first qualifying run, picking up a touch and losing time in two areas. I went out more assertively on the second run but I still lost time on gate 3, a downstream in an eddy. I managed to take on most of the upstream gates as sweeps, which I was pleased about from a technical perspective. I finished 22nd, and quite a long way off the pace. It was only when I watched the medal ceremony for qualifying later that I fully realised how disappointed I was in my performance, and that I’d paddled nowhere near my ability. Time for a turnaround. I realised that as a competitor I had fallen into the same trap that I’d helped younger paddlers deal with in my role as a sport psychologist. So now I needed to become my own sport psych and apply all the same remedies to myself. My goal for the WMG had always been to do the best runs I could, and feel proud of my paddling. Yet lurking in the background were other expectations; to win a medal, to finish ahead of other paddlers, to not make mistakes, to not let down my training buddies, to produce a perfect run, to justify the huge investment in time, energy and money I’d made over the last few years…. I also carried worries, as my shoulder was sore and I wasn’t 100% sure it would hold up. As I reflected on the first day’s racing I realised I hadn’t managed these expectations and concerns very well, and so they had affected my confidence and ability to paddle freely. By failing to acknowledge them, and trying to pretend they weren’t there, my expectations became a dead weight in my boat that slowed me down and sapped my confidence. I listed out all my expectations, especially the ones I felt a bit embarrassed or uncomfortable about. The act of acknowledging and naming a thought is a powerful way of loosening its grip. It changes our relationship with it – rather than the expectation having me, I start to have the expectation. Which makes it much easier to mentally lay it to one side and focus on something more constructive – in this case, reminding myself of my original intent to simply produce the best runs I could. 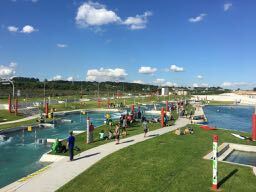 I was also much more excited at the prospect of racing on the Far Canal, because it was a fun, challenging stretch of white-water much more like my home training base at Lee Valley. I started the second day with a much lighter heart, feeling stronger and fresher on the water. When I got to the starting pool, I named my expectations and imagined putting each one the bank in a big pile of ‘stuff’. My normal start line routine then felt familiar and I was ready to go. I really loved my semi-final run, and although I lost a little time on upstream gates 3 and 17, the rest went to plan and flowed beautifully. I gave myself a 7 / 10 for the run, not perfect but decent and certainly a lot of fun. This was what I’d trained for! When I checked the results, I saw I was third in the semi-final. A nice confidence boost after poor runs in qualifying, but creating a whole new set of expectations to deal with. I realised my whole first run was a massive expectation that could get in the way of a fresh second run. I knew I would be one of the last off in the final so had plenty of time to rest, relax and cheer on my mates as they raced. My objective was still to do the best run I could, and to improve on upstream gates 3 and 17. The run started strongly and gate 3 was solid, but I wasn’t quite as light on the water through the middle of the course. This caught up with me on the cross between upstream gates 13 and 14, when I dropped off the back of a stopper and was low into the upstream. The next gate was a little sticky too, but I got back on line for the big move on the bottom fall to gate 17, which I did well. I was clean and nearly a second faster than my first run, so I figure I lost at least 3 seconds on 14 – 15. But it was still a nice run that I enjoyed delivering, and one that was a pretty fair reflection of my capability. My initial feeling was relief and a deep sense of satisfaction. My performance brought me in 8th overall, and 3rd in 55+, in a strong field. Nice to be on the podium again! 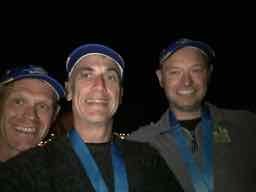 I was on a high for the team event, which I paddled with Mark Wignall and Andy Laird. We race each other regularly in the British Premier Division, so I knew we were evenly matched. We set a simple plan, which we went out and delivered well with a fast run that left us all buzzing. I was particularly pleased to paddle the small course confidently, as I hadn’t enjoyed the previous day’s events on it very much. Results were delayed, so it wasn’t until the prize-giving an hour or so later that we learned that we’d won, not just the 40+ K1 but the whole team event. This was a real treat, and not to be taken lightly given a strong team of Rotorua paddlers, and fast French and German entries. Time now to rest, reflect and take aim at the next missions – I’m thinking about the Sickline Extreme race in 2018 and there’s slalom in the European Masters Games in 2019. And in the meantime I want to keep building my technical skill and confidence to deliver it on race day. A big thanks to the Lee Valley Co-op (Huw, Ciaran, Connor, Zac and Luke) who have made the winter’s training so enjoyable. Stop what you’re doing and pay attention to your thoughts and feelings. Notice and name your worrisome thoughts or expectations. Pay attention to how you feel physically too. Don’t justify or defend your expectations, just acknowledge and accept that they are thoughts you have right now. Remind yourself of your intent – what you want to achieve. Ideally this goal is within your control and not about outcomes or other people’s performances. Commit to your intent, and remind yourself why you want it and what you’ve done to get this far. Return to your immediate activities and try to stay in the present moment, don’t think about the future too much.